This is the last update for me before I go on summer vacation. Looking back at the last 6 months reflecting upon what we have achieved together makes me so proud. When we entered into 2018 there were 11 cities in the programme and since last week when Beirut came on-board we are now 16 cities. We also have active networks and we’re invited to present our work at many different conferences. I’m already now looking forward to see where we will be taking Cities Changing Diabetes next but first it’s time for some well-deserved R&R. But before going there I would like to share the stories from this week. At the National Association of City and County Health Officials (NACCHO) annual conference in New Orleans this week, Houston Health Department and Harris County Public Health along with Institute for Spirituality and Health gave a 90-minute session on CCD Houston showcasing the Faith & Diabetes Initiative. The program was featured as an example of how local health departments can partner with non-traditional allies when developing and implementing new ways to engage hard to reach populations around prevention. The panel discussion and Q&A with the audience were very well received. It was a standing room only affair! Thank you so much Karin. Marisa and Klaus for this update and thanks to Faith Foreman and Stuart Nelson for being with us in New Orleans. This week began with CCD showing the flag at the World Cities Summit in Singapore. 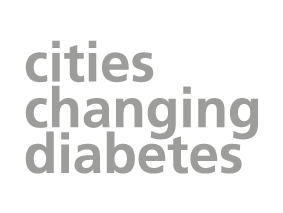 Ahead of the summit, I was interviewed byChannel News Asia for a very nice 4 minute piece about urban diabetes, obesity and healthy living with examples about time poverty in Houston, active mobility in Mexico City and Singapore’s ‘war on diabetes’. At the World Cities Summit, we joined forces with our partners from Gehl, Gehl Institute and C40 Cities to bring the topic of health and diabetes to city planners and decision-makers who were otherwise focusing on creating ‘smart’, ‘green’ and sometimes ‘liveable’ cities. At two side events, Bo (BoWe) explained why urban planning is essential to address urban diabetes and why it makes sense for us to partner with experts such as Gehl and C40 in this space. Sanjay Sridhar and Simon Hansen of C40 Cities explained the health and climate change co-benefits of redesigning streets to make room for pedestrians and cyclists with some recent cases from India and Mexico. Helle Søholt, CEO of Gehl, provided compelling examples of return on investment in healthy mobility and urban spaces. Jennifer Gardner from Gehl Institute presented the new ‘Inclusive Healthy Places’ framework for mapping and designing health-inducing public spaces with local citizens. The framework was developed with the Robert Wood Johnson Foundation and operationalising it will be piloted internationally in a handful of cities. Thank you so much Helle, Jennifer and Bo. It’s really important to connect urban planning with the health agenda as the challenges as well as the solutions are so interlinked. Also thanks to Lykke and Thomas for preparing the interview with Channel News Asia. This is it for now. I hope you will all have some time to relax. Please continue to send me your stories. I look forward to continue sharing progress with you once I’m back from vacation in August.